HERE’S something that’ll have you scratching your head whether or not you’ve had that lice infestation taken care of. 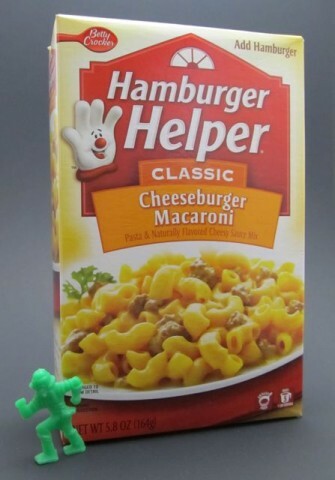 It’s a standard box of your Hamburger Helper. Cheeseburger Macaroni is the variety, and much like a 1971 Chrysler Imperial LeBaron Two-Door Hardtop, it is indeed a classic. Says so right on the box! Note: I have placed, by the box, a small plastic spaceman that seems to be dancing like the kids in that old Colgate Pump commercial, for scale. 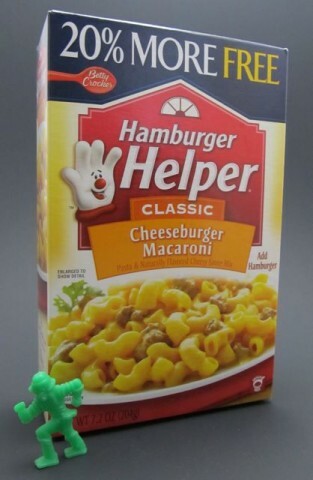 I’ve purchased the above, and just as the commercials say, or said, twenty years ago, probably, “Hamburger Helper makes a great meal!” Or “Helps your hamburger make a great meal.” Or “Helps you make a great meal.” Whatever! Look, that’s not important right now. I’ve also purchased the below. Yes, it’s the same species of Helper, except this box includes “20% MORE FREE.” Says so right on the box! Now here’s where things get confusing: While they’re including 20% more pasta and cheesy sauce mix, they don’t tell you to add any more meat! Instructions for both boxes – the regular size and the 20% MORE FREE size – tell you to use 1 lb lean ground beef. (Me, I used ground turkey – healthier for you and the cow, and tastes just as good!) Oh, sure, they have you increase the amount of water and milk for the 20% MORE FREE size, so the pasta and sauce consistency remains…uh…consistent. But no more meat! So now you’ve got one lousy pound of meat completely lost amidst a superfluity of 20% MORE pasta and cheese sauce (FREE). Calls to the Betty Crocker division of General Mills were not returned, mostly on account of I never made any. In fact, I lost almost all interest in this one by the time I was uploading the damn photos. Still, if anyone from General Mills would like to contact me, I’d be happy to receive a big wad of coupons, or a big crate of free product. Or some sort of Helping Hand collectible. Posted by Ted on March 28, 2011, 3:08 PM.